What a beautiful day to get married! 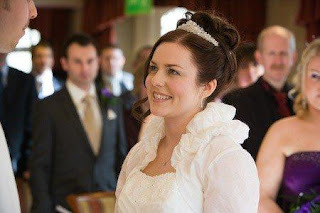 I love this photo - from the wedding dress and the collar of her bolero to her hair and make up with tiara. The composition of the photo is also a lovely one, being able to spot guests during the ceremony yet they are slightly blurred so we can focus on the bride. A lovely photo of a lovely person who deserves all the happiness of her married life - you can see how happy she looks in this photo! Make Up products I could not live without! There are two products in my Make Up Kit that I truly could not live without. They are top secret..... until now! This clever little pallette is a cosmetic camouflage cream that was developed to cover up birthmarks, portwine stains, psoriasis - It even covers tattoos! Because of the skin it was developed to be used upon, it has been made for even the most sensitive of skins. I bring my pallette to every job that I do, knowing that I can cover up ANYTHING I come across, and will always have the correct colour as there are 16 different colours in each pallette. This handy container is all that you need to make ALL make up waterproof and sweatproof﻿. It can be used in conjunction of ANY make up at all, as well as used with other dermacolor products - you simply hold it 12 inches away from your face, close your eyes, take a deep breath and spray. What a fun day to be had - and a wet one at that ! 13 pictures to come up with, all of which were taken under water to create a calender for a sycronised swimming club to raise money. 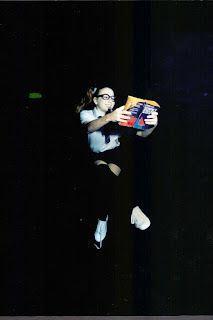 This is 'Miss September' - Back to School, and Yes, this photo was taken underwater - in a swimming pool believe it or not. This was a really fun shoot to do - I am an accomplished underwater make up artist as well as a diver. I spent the whole shoot doing hair and make up before entering the water to make sure that the end result looked as great as it could. After 12 hours spent in the pool, my skin was completely hydrated!